I haven’t been enamored with butterflying yet. Just with the people who are into it. I once saw group of Caucasian hobbyists in Chikmagalur chase after butterflies down a rocky stream. They came back after some time, dripping sweat and wearing crimson bruises. They seemed abuzz with love and laughter. I felt a little jealous of them; that they found joy in winged creatures that I had not, but I could taste their euphoria too. I am thrilled that people are into butterflying. It must feel holistically delicious like birding. In fact the life-cycle of a butterfly seems similar to ours. Like them, we survive our initial phases, leading cocooned lives. Later we crawl out and move slowly, feeling vulnerable, to pre-planned destinations. When we finally grow wings to dare the wind and change direction, some idiot clips them out of cruelty. Perhaps commerce drives us out of our own skies. Or we fly around for a short while before dropping dead. Majority of adult butterflies only live for about 30-40 days. What is different is that they still offer so much joy to even those chasing after them. Unlike many of us who go through our lives, taking all we can without giving anything back. We don’t even put ourselves in positions to be of some use. Maybe just isn’t our nature to be truly beautiful. The Malabar Rose is the prettiest butterfly I have seen so far. I saw her at the very beginning of a grueling trek in Thekkady. Then there is the Common Rose, a favourite of mine and a common resident in my city. Both of them looked devastatingly beautiful. Especially when the sunlight swam through their colourful wings. They belong to the red-bodied swallowtail sub-species. The Malabar Rose is however larger and can be found only in the wet jungles of Southern India at an elevation of 1000-feet or higher. 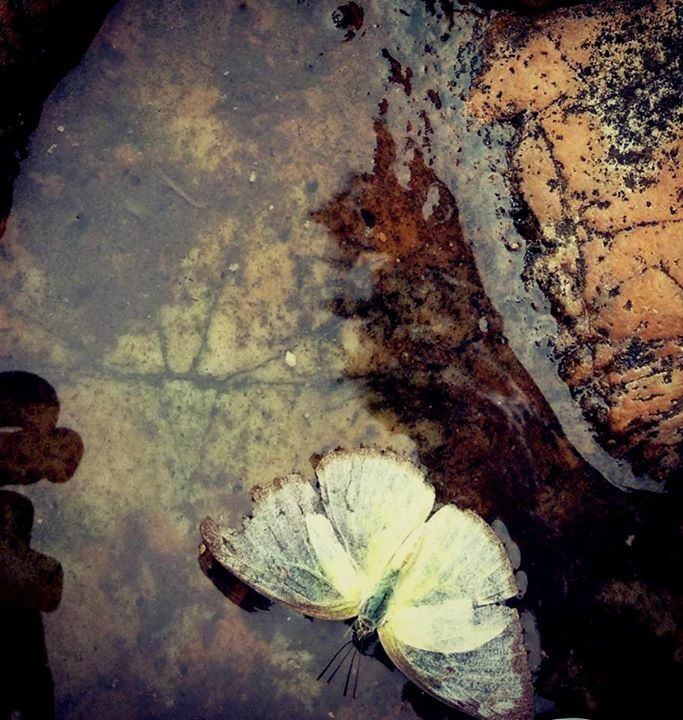 Also, two years ago, I wasn’t able to identify a butterfly which had died inside a puddle. I was sitting near the Anjuaveedu Waterfalls in Kodaikanal, bemoaning her loss. It didn’t seem fair then that my ignorance might make her death a little less tragic. And so I named her. Here lies, lifeless yet loved, Miss Amber (probably March 2013 – March 2013). 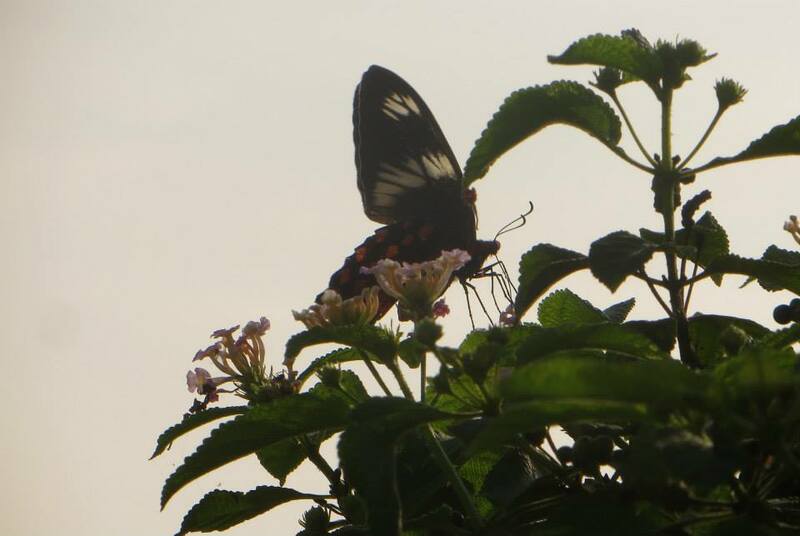 For lovers of nature, its wondrous creatures and fluid prose, please immediately head on over to the Glasswing Butterfly’s blog. The author climbs trees, maybe even literally, to bring to us the best parts of Singapore. The pink and white is so dramatic ! Nice words. Rose with a cold! Beautiful. Your verses have the power to surprise (at least me!). Beautiful! Wear her thorns on different body parts like blood orange tattoos!! Clincher! Thank you so much moxie! Perhaps not the malabar but I m sure a princess just as pretty might be lurking around in your parts. Do keep an eye and a smile out for them! Ha 🙂 nice. Thank you! I am so taking your word for it, missy 🙂 and it was my pleasure! Thank you so much for this. She has an actual name. Sniff l. Really! Such a beautiful writeup! And gorgeous butterflies too! Butterflies are my favorite creatures- every time I look at one my day is brightened with joy. I m just starting to appreciate them, I hope they give me as much joy as birds do. No harm in being greedy about such love I think. Thank you for the kind words, L.
I have spent many a blissful moment chasing after butterflies too. it’s wonderful!